Trying to pick a suit designer for your show? It's easy to get sucked into the rabbit hole of sparkly bikinis on social media, and even easier to forget the power of a good photo. Here are some questions I recommend asking when you make first contact with your potential designer: How long have you been making suits? If the designer is brand new, they may still be working out some of the kinks in their design... I know it took me a while to get everything exactly how I wanted it. Many designers don't... and this means your straps will not be as stretchy. Personally, I really like my straps to feel super sturdy and have a good amount of stretch in them, so all AmandaLouise suits come with straps that are sewn on high quality elastic. What's your current lead time, and are there any rush charges? I always recommend ordering your suit 6-8 weeks out to allow plenty of time for things like custom materials, but usually you can get a designer to make one quite a bit faster than that. I've literally gotten an order on a Monday for a show that was Friday. AmandaLouise DOES have rush charges. If you want your suit in under 3wks its a $50 charge, under 2wks is $100. Swarovskis, hands down, are the superior crystal choice. That said, they are about double in cost (at wholesale for your designer) compared to the very high quality Czech stones. I've seen a few suits with really cheap plastic "stones" that just do not shine the same on stage. I use primarily Swarovski, and step down to the Czech crystal when the Swarovskis are out of stock or not available in a color I need. Glue vs Heat Press. I've done both. For the first two years I was a heat press girl... now? ALL GLUE. It definitely takes me longer, but I have not lost a single stone since I started gluing. The trouble with heat press is that the stones come with glue already on the back of them, and it is a TINY amount. When you put on your suit, the fabric stretches and can compromise that tiny bit of glue to the point where the stone falls off. Will my suit come with padding and/or padding pockets? Please ask this!!!!!!!! 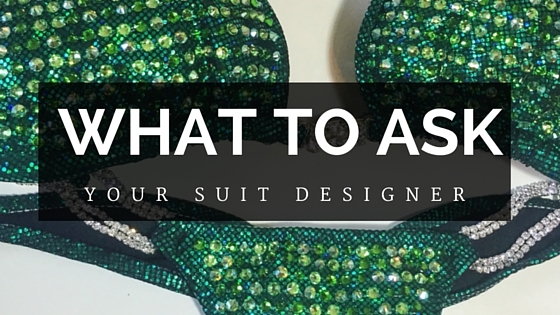 I have had countless clients come to me annoyed with their suit from another designer because they made an ASSUMPTION about how their top would be made. I've seen suits that have no padding pocket, a padding pocket but don't come with padding, and padding that is SEWN in and can not be removed. AmandaLouise suits all come with the padding pocket and are stuffed with teddy bear stuffing. After 3 years of making suits, I have found that this is by far the best way to achieve some extra size for the girls while looking natural. Most of the harder push up pads out there will create a gap between the suit and your skin which can lead to some not so awesome peep shows while you're posing!